In the simplest form, Gantt Designer is just one file: Gantt.exe to run (almost) all features. This file is about 700kb and can reside anywhere, including a thumbdrive. 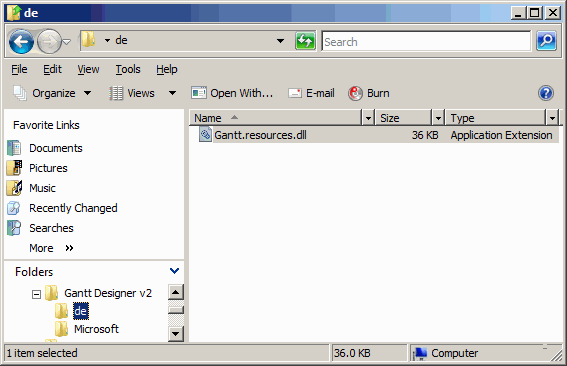 If you are using the single executable file option and wish to be able to launch Gantt Designer by double-clicking on a Gantt Designer chart file, you have to manually associate the .gnt file extension to the program. Note: Please that note that the in Windows Vista, saving files to the Program Files folder requires that you log in with the administrator account or you must turn off User Account Control. For Windows 7, you just have to belong to the Administrators group. If you want the capability to open Microsoft Project files, then you need to have a folder named Microsoft and the additional files as shown below. 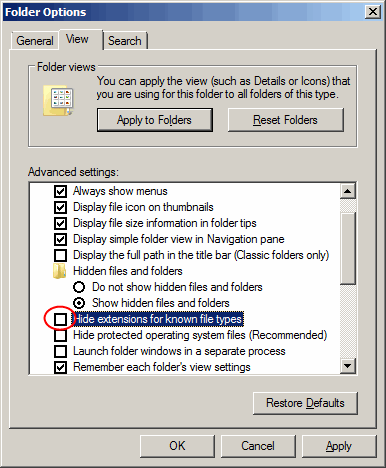 The location of the files and folders relative to the location of Gantt.exe must be followed exactly. Click on the items in the image above to download the respective files. The first four files in the Microsoft folder are in the public domain subject to their respective licensing terms. 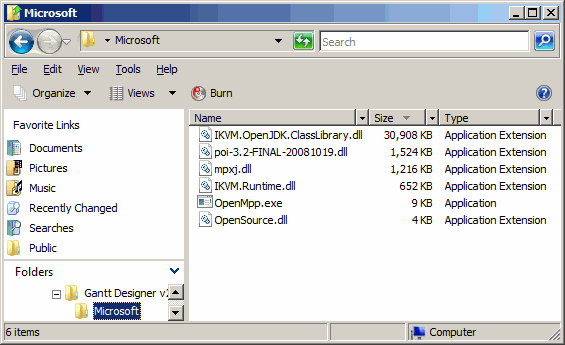 OpenMpp.exe and OpenSource.dll are from Timios Ideas and their sources are OpenMpp.cs.txt and OpenSource.cs.txt. 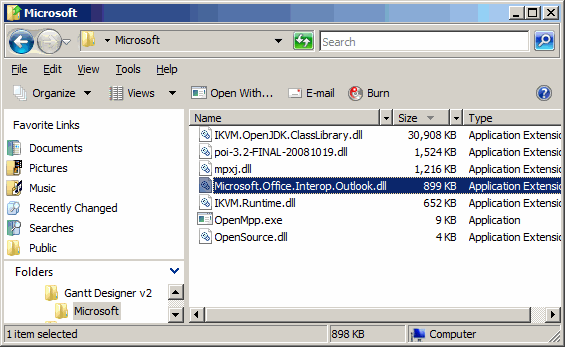 If you want to be able to extract holidays from your Outlook into Gantt Designer, you need another file, Microsoft.Office.Interop.Outlook.dll of version 12, in your system. If you have Office 2007 installed this file may already be on your system in which case you do not have to do anything more. Click Help About Gantt Designer and look under Assemblies loaded. 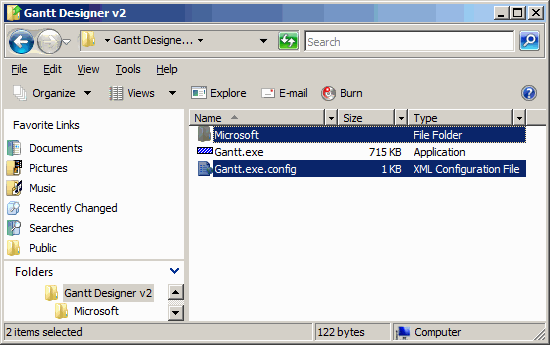 The Gantt.exe.config file must be present in the same folder as Gantt.exe if you add the DLL in this manner. Note: The ability to open Project files and read the Outlook calendar are independent functions. You can have one or the other or both or none. Just make sure the required files are present for the features you want. If you need localization, that is, the ability to see menus and messages in a non-English language, another folder corresponding to your language is required, and inside this the correction version of Gantt.resources.dll must be stored. An example of a German localization folder is as shown below. You can have as many localization folders as you like. The name of the file in each folder is exactly the same though the contents are different. To see the list of localization files available, please visit the Localization page. Next: more files created when you run Gantt Designer.